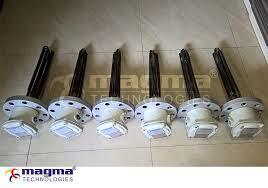 We are leading Manufacturer and exporter of “Explosion Proof Heaters”. The term explosion proof and flameproof are identical where the internal ignition of a flammable atmosphere will not be transmitted outside the enclosure, thereby prevents the ignition of the surrounding flammables. Flameproof is preferable mode of protection when electrical equipment may potentially have high energy arcing or sparking components in normal operation and therefore the formation of an explosion when in a hazardous atmosphere is not easily avoided. MAGMA Explosion Proof / Flameproof Heaters are made with housings that can withstand explosions, sparking, arcing, and flames during the heating of materials. These are designed for industrial purposes, especially in hazardous locations where there is always a possibility of explosion or fire due to the presence of flammable gases, vapors, powdered metals or dusts. There are various varieties of mounting available for field installation. All types of enclosures are made from light weight cast aluminum alloy of LM6 terminal enclosure with weatherproof protection is attached on the heater according to requirement demand. There are several types of protection techniques acceptable when designing products for use in these classified locations: Explosion proof, dust ignition proof, dust tight, pressurized and intrinsically safe. These enclosures set criteria to prevent an internal spark or explosion from causing a much larger blast. All components are labeled with the distinct classification in which they have been tested and approved for installation. There are various options available according to temperature class (T1 – T6), choice of element sheath (Copper, Monel, Incoloy and Stainless steel). These heaters can be incorporated with sensing devices such as RTD’s, thermostats or thermocouples. MAGMA EXPLOSION PROOF / FLAMEPROOF HEATERS are suitable for installation located in ZONE 1 and ZONE 2 hazardous areas where the flammable atmosphere is either group II A, II B, or II C gas. Applications for these heaters may include oil and gas, chemical works, petrochemical plants and fuel servicing areas. ALL CERTFICATIONS CAN BE GIVEN ON REQUEST.